Home » Tile Cutter vs Wet Saw: Which Is Best for Your Project? Let’s paint a picture. You’re replacing the tile kitchen counter. Or maybe it’s the tile bathroom floor. But your tiles just won’t line up. After an hour of frustration and a few choice words, you’re ready to call in the professionals. Good move, right? Stop right there. Tile cutting isn’t difficult. Just because you’re an amateur tile setter doesn’t mean you should shy away from cutting some tile. It all comes down to choosing the right tool for the job. Tile cutters and wet saws are the two best tile cutting tools for amateurs. But which you should choose depends on the specific job at hand, the materials you’re cutting, and more. That’s why today, we’re bringing you our guide for choosing the best tool for your project. When it comes to the great tile cutter vs wet saw debate, we’re here to help. Let’s get started. Tile comes in all different varieties. Ceramic tile, clay tile, and porcelain tile are the tiles you’ll commonly see at the store. Though these three types only scratch the proverbial tile surface. Ceramic tile is made from sand, water, and clay. The materials are molded into a square and then baked in a kiln to remove moisture. Porcelain tile is made from a denser type of clay than ceramic tile. Clay tiles are entirely clay. Ceramic, porcelain, and clay tiles are either glazed for inside use or unglazed for roofing. Tile types such as glass, cork, concrete, and stone are used for any number of other applications. There’s no rule dictating which tile you can or can’t use for a project. Though some tile does hold up better in certain environments. Your “floor plan” refers to where you’re laying tile. Every project comes with unique spatial challenges. Sometimes you need more tile, sometimes less, and other times you need to cut tile. Accurately measuring your floor plan is imperative for choosing the correct amount of tiles for your project. Measure the entire floor plan’s boundaries, diagonal interiors, width, and height. Next, measure one square of sample tile. Use those numbers to calculate how many tiles you’ll need for your entire project. Don’t forget to account for abnormal boundaries. Order extra tile to ensure you have plenty to cut when it comes time to assemble the puzzle pieces. Chances are almost certain you’re not working with perfectly straight boundaries that are a multiple of your tile size. Cutting tile is the only way to make most projects work. Your two best tile cutting options are tile cutters and a wet saw. Tile cutters generally take more time, less skill, but are more convenient. Wet saws take less time, more skill, but are less convenient. 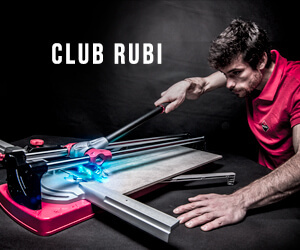 Each is readily available through the Rubi store. Which you should choose is an entirely different story. Ready to learn the difference between tile cutters and wet saws? Let’s get started. Everyone should have tile cutters in their toolbox. The cutters look somewhat like a car jack with a bar that runs from top to bottom. Tiles get placed inside the cutters and scored. The tiles break along the scored line. Tile cutters, by nature, take longer to use than wet saws. You need to find your tile, place it inside the cutter, score the tile, and finally snap the tile along the score. What’s more, harder tiles don’t score well. Glass tiles won’t score at all. Breaking tiles along the score isn’t always easy. Sometimes the tile cutter won’t score deep enough. Other times the tile just doesn’t want to break. Expect to fight with more than a few tiles. Tile cutters work best for either smaller projects, projects with straight borders, or projects with soft tiles. Smaller projects mean fewer tiles to cut, tile cutters can’t cut wavy lines, and softer tiles snap better after scoring. Our website lists a number of different tile cutters. We carry different sizes made to accommodate any type of project. We also sell the maintenance materials, like lubrication, to keep your cutter smoothly working. Wet saws are best for large projects when your tile cutters aren’t cutting it (literally). Instead of relying on human power, wet saws use electricity. At first glance, a wet saw looks like a table saw. A rotating diamond blade cuts the tile while a guide keeps your tile straight. Water sprays from around the cutting blade to ensure the tile doesn’t smoke and burn. Some tables come with a water reservoir while others can connect to a water source. Wet saws cut tile extremely straight. The guide helps make perfect cuts so long as your hand doesn’t shake. With some skill, you can also cut tile into intricate shapes. While tile cutters can only cut straight, a wet saw can create curved tiles. Wet saws can also cut harder tile materials. The diamond blade can cut the hardest varieties of tile. The wet saw is a must if you’re cutting glass tiles. Compared to tile cutters, wet saws are best for large projects. You can cut tile faster, easier, and with more precision than tile cutters. Wet saws are a must for large rooms or rooms with complicated floor plans. Skill and size are the wet saw’s main drawback. The units are large and they also take time to learn. You need to understand safety procedures before getting started. You also need to practice using a moving saw to cut straight lines. Buying a wet saw comes down to understanding what you need. Different saws come equipped for different jobs. Check out our wet saws to see the available options. The guide above should serve as a good start in the tile cutter vs wet saw debate. Material, project size, and skill all factor into your choice. However, the best choice for your project isn’t always straightforward. Sometimes money, time frame, tile type, and more can all influence which tool to choose. If you’re short on time, do you really have the luxury of ordering an expensive wet saw? That’s where we’d like to help. Our experts would love to hear all about your project and help you decide between a tile cutter and a wet saw. We’ll take the time to ensure you’re buying the right tool for the job. If you’re planning on tiling often, it might make sense to buy a tile cutter and a wet saw. You’re likely to run across situations where you’ll need each tool. It’s always best to have the proper tool for the job. So if you’re ready to get started on your tiling project, get in touch with us. We can help you choose the best tool for your project. We guarantee you’ll leave satisfied.